New York, NY — To nearly 30,000 students every year in New York City, the acronym ‘SHSAT’ can bring anxiety as well as opportunity. It is the specialized high schools admissions test, or SHSAT, that is currently the sole criterion for entry to eight of the most elite high schools out of hundreds in New York City. Based on my experience supervising the administration of the SHSAT, I always enjoy speaking about this exam and admission to these schools when I conduct talks citywide. I wanted to take this opportunity to share some background information with you here. Originally consisting of only three (Brooklyn Tech, Stuyvesant, and Bronx Science), the list of specialist high schools requiring this test (‘the specialized testing schools’) now numbers eight. The Brooklyn Latin School represents the newest, having entered the ranks in 2006. The combination of the elite status of these schools, along with the SHSAT representing the sole criterion for entry to these schools (at least for the time being! ), has created an aura surrounding these schools and an ongoing debate about the efficacy of the test. As has been written about and discussed ad nauseam, students have been known to prepare for this test for months, sometimes years. For students and their families, the perception is often that entry represents a ticket to some of the best colleges and universities throughout the country. Other students, while arguably in the minority, will prepare minimally, taking their chances that their innate test taking abilities will earn them a spot in one of these elite schools. Test preparation takes many forms, ranging from doing nothing, to reviewing the sample tests in the city’s specialized high schools handbook, to expensive one-on-one test prep. Make no mistake – this is a challenging, unique test with some sections that are not commonly found on other tests, so some type of preparation is recommended. This applies even to top students who may do well on other tests. For the families with whom I work, I will often recommend at least taking advantage of multiple, free mock testing that is offered across the city by various organizations. Bear in mind that true, mock testing is done in simulated conditions, using similar timing, materials, class configuration, protocol, etc. as the actual test. Effective mock testing will place the student in an environment that closely mimics that of the actual test so that when he or she walks in on test day, it is not a foreign experience. It is important to note that many test prep companies will offer families a converted composite score as a diagnostic tool. This assumes a conversion computation from raw (based on number of correct answers) to composite score. Families must understand that this is merely an estimate, as the actual conversion from raw to composite is quite complex and not completed by the city until the test is actually administered. While these estimates can help serve as a diagnostic tool and inform the preparation process, caution should be used when drawing conclusions about a child’s candidacy for particular schools. Students who are eligible to sit for the fall test include New York City residents who are either current 8th grade students or first time 9th grade students. Registration is simple and takes place in the fall through the student’s school. Indeed, it is preparation for the test that is the challenge rather than registration. Additionally, many families with whom I work are shocked when they hear that the schools pay no attention to course marks, attendance, teacher recommendations, or any other criterion for entry. Thus the debate about using the test as the sole criterion – some arguing that it does not truly measures a student’s aptitude for entry, other arguing that it’s biased, others still saying that it favors families who can afford pricey test prep. Of course, many will still stand by their opinion that, unlike for many other schools, this is one of the remaining, true meritocracies that rewards only those who perform best on the test, period. The test format is relatively simple: two and half hours, two sections, one verbal and one math, all multiple choice. The number of correct answers, equating to the raw score, is converted into a 3-digit, composite score by the city – typically ranging up to the high 700s. There are no penalties for wrong answers. There is also no written portion of the test. After registering for the test through the school counselor in the fall, the counselor will issue test tickets to students just before the test administration with the assigned testing session (test site is based on where the student attends school). On those tickets, the student is asked to agree with his or her family on which of the eight schools they wish to apply to, as well as their order of preference. These choices are then copied by the student from the test ticket onto the answer sheet on test day (schools will not see this ranking!). To help families learn about the schools, the city will typically ask each school to offer a large open house in the fall prior to the test administration. Some of the schools provide tours and other events on their own. It is best to check their respective websites for details. It is important to note that the eight specialized high schools are not the three, original ‘science schools’ of old. Indeed, these eight schools represent a wide variety of schools, learning environments, teaching philosophies, course offerings, extracurricular activities, etc. Families are urged to do their homework, decide what represents a good fit, and understand what qualities are important to their children. Unlike the matching process to other city high schools, offer determination to these elite schools is actually fairly straightforward and based on three factors only: seat availability, the student’s score on the exam, and the demand for each school, i.e. the choices of schools made by students on the test answer sheet. The computer puts all the scores across the city in order from highest to lowest. Working its way down the list, seats will be filled using students’ preference of schools. When the computer has reached the point at which seats for all eight schools have been exhausted, the last offer will have been made. This is what is commonly known as the ‘lowest qualifying score.’ While this may vary from year to year along with the number of offers made, the lowest qualifying score tends to be close to 470 or thereabouts. As a general rule, the city does not release qualifying scores for each of the schools after the test administration. They change every year and are based on the three factors mentioned above. I recommend using caution when interpreting so-called unofficial ‘cutoff scores’ that are often published based on anecdotal information. In reality, they have little to no value during the test prep process, and I advise families to apply to as many schools as they are willing to consider – regardless of an anticipated score. I have seen students omit certain schools on the test answer sheet – or list them as a lower preference on the answer sheet – only to qualify for that school. If it’s not listed at all, or is listed below another school for which a student qualifies, the student can’t get an offer to that school. Offers are made in March, at the same time as students are notified of the results from the regular high school application, commonly known as ‘round 1’ results. 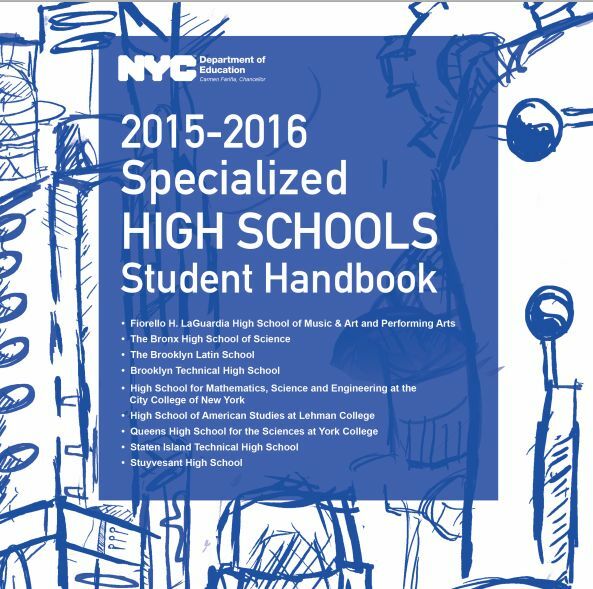 A student can only receive one offer to a specialized testing school (note, this does not include any possible offers to LaGuardia High School, the lone specialized arts high school). There are no waitlists and no changes; whatever offer a student receives must be taken or declined, thus the importance of making the right choices – in the right order – on the test answer sheet. Students who receive an offer to one of the specialized testing schools will usually also receive one “match” from the regular high school application. The student may then choose between the two. At that time, the student will also receive the score they earned on the test, whether or not they received an offer from one of the specialized high schools. On any given year, only several thousand offers are made to the specialized testing schools from the tens of thousands taking the exam. Finally, it is critical for families to understand that if they truly wish to maximize their number of public school options, it is important to take the regular public high school application very seriously. As most people recognize, admission to a specialized high school is extremely competitive. I have seen many families that put all of their proverbial eggs in one basket and bank on the SHSAT, only to be left without a high school. Having said that, some families only wish to consider the specialized high schools or a selective private school, for example. In that case, they may be in a position to take more of a risk securing a public school option. To determine the best school search strategy, I recommend that families speak with an admissions expert. The school counselor is a good place to start, and of course I am available for a complimentary phone consultation at most times throughout the year. Keep in mind that while there are some outstanding test prep companies and tutors, not all of them have an in-depth understanding of the high school admissions process; families are advised to do their homework, optimize all school choices, and make sure that their overall school search strategy is comprehensive and sound.